Explore the rich history of cinema like never before - from the golden age of black-and-white films to international art-house and 21st-century sci-fi - uncovering the key themes and big ideas behind more than 80 of the world's most celebrated cinematic gems. 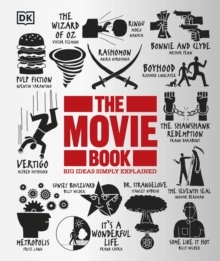 Beginning with the iconic La Voyage Dans La Lune (1902) and ending with Richard Linklater's ground-breaking Boyhood (2014), The Movie Book chronicles more than 100 of the best films ever made - from comedies and dramas, to animations, documentaries, and brings cinema to life. Discover everything about your favourite movies, as well as celebrated classics, the films you need to see, through iconic quotes and film stills, posters, biographies, movie memorabilia and narrative timelines. Essential for anyone with a passion for cinema, The Movie Book is ready for its close-up.